It could be argued that Minky blankets are the best blankets money can buy. Minky fabric is irresistibly soft, with mom-approved durability. Our high-quality Minky blankets make the perfect gift for babies, children, and adults; this silky-smooth fabric has no age limit! What’s better than an ordinary Minky blanket, you ask? A personalized Minky blanket, of course! That’s right; you can design your own Minky blanket right here so that you or someone else can enjoy this snuggly gift for a long time to come. After all, everyone knows that a personalized gift holds a little something extra special. Remember those little plastic license plates that had names stamped on them? Now remember how excited you were when you got one with your name on it? Something so simple brought so much joy. On the other side of this story, however, lie the people who could never find their name on those little rectangular pieces of plastic, or if they did, it wasn’t the right spelling. So for all the “Apples” of the world, here’s to you kid! You can have one of our monogrammed Minky blankets designed with your name on it, any name, spelled any way you want! Not many things in life can be personalized just for you (or your loved one), so you definitely don’t want to pass up an opportunity like this. The process of making these customized Minky blankets is super simple, and you can see exactly what your personalized blanket will look like every step of the way. We encourage you to play around with it until you’ve found the perfect combination. Our custom Minky blanket will last a very long time so you want to make sure you get it just right. You get to choose every detail of your custom Minky blanket, right down to the monogram font and thread color. 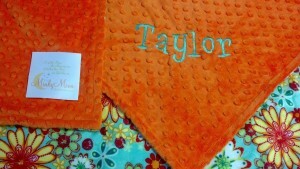 Personalized Minky blankets are great gift ideas for any occasion or even no occasion! Give them to a mother-to-be at her baby shower, as a housewarming gift for the newly-married couple, as a birthday gift for that special little toddler in your life, or as a Christmas stocking stuffer for your significant other. There’s no wrong time to give such a special personalized gift, and anyone who receives one will be happy…even if it’s just an ordinary Monday. Soften up your loved ones today by designing them their own personalized Minky blankets! This entry was posted in Minky Blankets on January 21, 2016.